It looks like a fun and happy event. So glad girls were also included. They have grown up so much. Their hair look gorgeous, making them look more grown-ups. Alexia looks strickingly like Maxima. This is how Max would look with darker hair Ariane has really interesting eyes. The girls are beautiful. Amalia is really growing up. I see her father in her, Maxima in Alexia, but who does Ariane resemble? I can't figure it out. Regardless, a lovely family. I guess it is also a hard to decide item for others, as we tried to pinpoint it yesterday (based on the new official pictures of the DRF). Amalia is more like the Orange Nassau fafmily, like daddy, grandmother and so. While Alexia seems to be a kind of carbon copy of Max. I always thought she looked like Bea, but maybe you’re right! Maybe even throw a little Friso in! Those girls are something. And W/M are doing something right there... take note, royal cohorts... I see these girls and the Spanish girls as some of the best adjusted and trained. Another small item during Kingsday was the remark of famous Dutch swimmer, Ranomi Kromowidjojo, to Amalia. 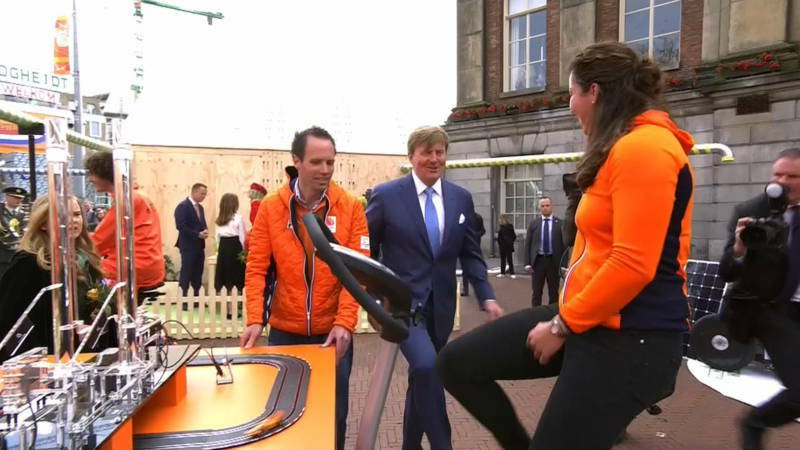 The Olympic medalist was part of the route that followed by the royal visit on King's Day in the provincial capital. She was sitting on a bicycle with which she generated electricity with the aid of hydrogen to drive cars on a miniature race track. There she first had a chat with King Willem-Alexander. When princess Amalia asked her how this all worked out, the swimmer reacted somewhat bluntly. She then starts with an explanation, but is interrupted. Then someone else explains to the princess what she sees before her. In the Netherlands there was again commotion when people were negative about Amalia through social media during and after Kingsday. In particular her figure was criticized, she was called fat outright. Of course there were people who opposed it yes or no through social media. In my opinion Amalia is not one of the slimmest, but this seems to be her physique. And according to the reports, from people who encountered her in public or in a private setting, she is a nice girl (in behaviour). I guess with regard to her physique she resembles her fathers family a lot. I can remember she had the similar round shape of the head, since early on. That is just so ugly. I truly hate to hear stuff like that. Amalia is a beautiful girl with a gorgeous smile, eyes, skin and hair. She seems to have a wonderful bubbly personality and she will make a fantastic Queen some day. Beyond that, they should keep their ugly thoughts to themselves. Look at Wilhelmina - nobody was as kickass as Wilhelmina. The point is, if Amalia is eating healthy food and her parents are happy with what she's eating, then it's nobody else's business. I have very close friends in the Netherlands and there are so many things I truly love about the Netherlands, but sometimes I have seen folks there say truly unfortunate things that they should have let their inner filter keep them from saying. A lot of Dutch people would state that they are direct, not rude. Or that they have the right to say what they want to say. But I agree with you a lot of things are said, which wouldn't have been said if that inner filter would be applied. Fortunately a lot of people reacted angry, some even furious upon those negative remarks about Amalia. Not every person is born to be a skinny-minny, and Amalia is a beautiful girl. To have this pressure put on her is really a shame. Maybe she will slim down as she grows older, but as long as she is healthy, who cares? She has a lovely face and, more importantly, appears to be a kind, well-adjusted teenager. Max and Willem have a lot to be proud of, and Amalia should be proud of herself! Sorry, it was not my intention, I was only referring to a current issue around Amalia in the Netherlands, which pops up regulary. If I remind it correctly, Kingsday 2017 also resulted into critical, negative remarks about Amalia and her physique. As often happened and happens during and after the larger events in which Amalia participates. Fortunately there are also many (Dutch) people who try to stop these remarks, and counteract. It breaks my heart that Amalia will hear and absorb this criticism especially at such a delicate age. She appears to be a lovely young woman. She is in her early teens and not fully grown yet, her body is going to change a lot. That’s normal. I’m glad she has WA and Max for parents because I think they will try as hard as possible to instill healthy self-esteem and not tear her down like Sylvia did with Victoria when she struggled with her weight. We all know how well that went. Victoria is her godmother hopefully she will be able to mentor Amalia since she went through something similar with the press/public commentary on her weight. If Amalia turns out the be an entitled jerk that’s something to comment on but I don’t understand why anyone would criticize a child’s appearance. Well that lady who made the remark about the chips (crisps) also mentioned that she "noticed it" and "just said what she, and others thougt". According to her it was no (cyber)bulleying. But an anti-bullying expert said it was definately bulleying (as if it wasn't clear to the rest of us). Apparently a lot of people are more rude and insulting when in cyberspace, safe from behind their computer (phone, laptop etc.). Most of the time using a fake name. Things they wouldn't have said aloud against the person or person they are targeting. For every jerk that makes fun of this kid, there needs to be people like the good lesbian cat ladies on RD standing up and saying 'leave her alone to be a kid'. I once got a good piece of advice from someone about being 'honest' and 'just saying what others are thinking'. You don't need to be unkind to be honest. There's a difference and a wise person knows the difference. The jerk doesn't.